Mushroom Kingdom Fusion Revival is an ambitious Mario fan game where a cast of crossover characters explores locales based on various video game series. Featuring elements from everything from Mario to Mega Man to Halo, the game was originally developed by a team led by Judge Spear before it was cancelled and rebooted as the title we know today. And given that the team at Gaming Reinvented are diehard fans of the title and have been supporting it for a couple of years now, we were pleasantly surprised when we managed to arrange an interview with its lead developer, French game designer and fan game maker Feguelion. So here’s our interview with him about Mushroom Kingdom Fusion and its reboot, as well as some of the ambitious plans the team has for everyone after it’s been released. 1. So, what was your background before Mushroom Kingdom Fusion? Can you tell us a bit about who you are in real life? A: I began programming at the age of 7, obviously at that time my games weren’t great. Most of my first fangames were Sonic-related, as Sonic the Hedgehog on the Megadrive was the first game I ever played. I also like experimenting with new things, though I never really thought of publishing my works before, because I didn’t really feel ready for that. Mushroom Kingdom Fusion and Super Mario Fusion: Revival are probably the games that gave me the most interest in Mario fangaming. 2. On a similar note, what were your previous experiences in game development? 3. What made you decide to continue Mushroom Kingdom Fusion? A: I immediately loved the game’s concept upon discovering it, even though I didn’t play it much because my laptop doesn’t really like it*. When I heard about its cancellation and it going open-source, I thought it would be an interesting experience to work on a revival, and I didn’t want the game to go to waste. 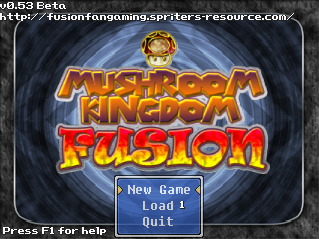 * Mushroom Kingdom Fusion was well known for being a memory intensive game that ran into issues on more modern PCs. The reboot will hopefully fix these issues. 4. What’s with the name ‘Revival’? Is it connected to Super Mario Fusion Revival? A: Not really, in fact I didn’t think of a title for the remake, it was Cap’n Coconuts, a SMFR developer (and former MKF one) who came up with the name. 5. What are your favourite levels and bosses from the game and why? A: I like the concept of fusion levels, which basically combine two or more games, because it’s quite representative of MKF’s concept. The most popular of these levels is probably The Crossroads. I don’t want to spoil bosses too much, but I could mention the infamous Cacobirdo. Above: The Cacobirdo is a Birdo/Cacodemon hybrid, a horrifying concept in every way. Above: The Crossroads is a massive mix of different video game universes in the form of a single level. 6. And on a similar note, what ones are your least favourite? A: One level called Yellowstone Journey had a chase section which was later scrapped because of unfair design. Basically you get branching paths, and you have to be lucky and pick the right one, otherwise you get hurt or die. I’m not a fan of such design, and it will be avoided in the revival. I was also not a fan of Zebes, which was really long, it will most likely be shortened in the remake. As for bosses, I could mention Boom Boom, who will get a second phase, because he is actually easier than the boss of the ghost house preceding his fortress, and of course it doesn’t make sense. Above: The chase section in Yellowstone Journey is an infamously annoying part of the original Mushroom Kingdom Fusion. 7. Given some levels have been scrapped, what made you decide to scrap them? A: Some scrapped levels were carbon copies from other games, like the first level of SMB: The Lost Levels. Although levels with bad or unfair design are usually revamped, some still had to be scrapped in order to reduce the size of some worlds. World 3, the Megaverse, will even be remade from scratch to have eight robot masters stages as in typical Megaman games, with a few boss levels. We also want to avoid having too many different gimmicks. 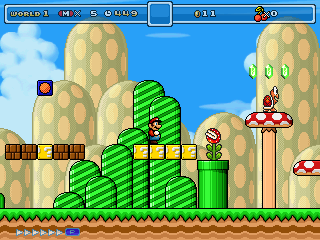 Above: Birabuto Bash and Muda Madness are two scrapped levels from Mushroom Kingdom Fusion. This is because they were remakes of Super Mario Land stages. 8. How do you plan to avoid feature creep in this reboot? A: Unlike the original game, features are being added only if they are necessary, not for the sake of nostalgia. For example, the Classic Mario playable character allowed players to control Mario in a SMB1 style, that’s a nice blast to the past, but it wasn’t really necessary, therefore we scrapped it. 9. Given that the game was cancelled before they were done, what are your plans for the levels shown for version 0.5, like Fire Temple, Dracula’s Castle, the Moon, etc? A: For such levels that are going to be kept in the remake, I’ll contact former MKF developers. They confirmed that they still have these resources. 10. What were your thoughts about the original game’s cancellation anyway? A: The project was going out of control and developers lost motivation to work on it, so cancellation wasn’t unexpected. I thought it was a shame obviously. 11. Do you have any interesting ideas for new levels, content or features? Can you share some of those ideas? A: Recently I implemented an alternate soundtrack system, that way players can use a much lighter soundtrack than the original. I do have in mind some levels ideas, like the World 2 boss levels, which could be based on final stages from the Metal Slug franchise. Some of my fellow developers and myself also made concepts for the final boss, although I won’t spoil these. Also some bosses from scrapped levels will be used to replace other bosses like the Koopalings, who will be used later in the game. 12. During the original game’s development, a few levels were scrapped. Do you plan to bring any of those back? A: We do not plan to bring these back. Most of these were from the final world, which will be remade from the ground up. Above: Christmas Nightmare will probably not return in the reboot. 13. Many people have been inspired by Mushroom Kingdom Fusion over the years. So what advice do you give other prospective fan game developers based on your experience with this game? A: When getting into game development, you should start small and try to stay focused on a single game engine to become familiar with it. It is also better to work on a single project at once, otherwise developing them will be slower, and motivation could be lost. And of course when thinking of a new feature, make sure it is really necessary. 14. So far, what challenges have you encountered when making the game? A: A problem I have is with level design. Since I never published my games before, I didn’t get any feedback for my levels, and unfortunately I lost these games, so I’ll make sure to have my original level design tested before implementing it officially. 15. Once Mushroom Kingdom Fusion Revival is done, what do you plan to do next? A: After Mushroom Kingdom Fusion, I plan to work on my first indie title and learn advanced programming languages such as C++. I can’t really say anything about what I plan for my indie game, as I’m staying focused on MKF’s remake. So, any thoughts on our first major interview? I find it interesting that the first and second question were answered exactly the same. His native language isn't English. Maybe he thought the questions were the same.